The 4000E series clocks support a number of interface modules and peripherals. They can be used with satellite or radio time-code receivers. 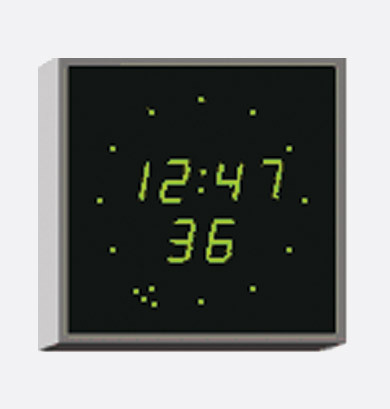 The 4000 series clocks and calendar clocks provide a precise and elegant display of time, or time and date, using bright and clear LED characters with both manual and automatic brightness control for energy efficient use. The various display formats are available in a wide variety of sizes with character heights from 14mm to 220mm and suitable for use at maximum viewing distances from 3 to 100 metres. Some of the more popular types are held as stock items, but others are available to special order, on short lead time. The 4000E versions may be used as stopwatch, programmable timer or up/down time counter when controlled with supplied infrared (IR) handsets, an optional wired control panel or user-supplied voltage-free contacts. The 496E external switch unit enables both up and down counting from a pre-programmed start time with a wide range of programmable display freeze and counting modes with an optional relay closure when the count reaches zero. 4000E versions can be used either as master clocks, as slave clocks controlled by one of a variety of signal sources or as stand-alone units, operating from their internal, high-stability, quartz crystal, oscillator. They can be controlled and synchronised with a Wharton 5000 series time-server using w482 time code or with one of the time code receivers - 488HS3-GPS, 488HS3-GLONASS, 484.02 (MSF) or 484.03 (DCF77). See Wharton Clocks - Time code receivers - Satellite and radio. MB serial and MobaLine time codes are supported, as well. Optional interface cards for further input codes and coded outputs are supplied separately for user fitting, and should be ordered as required (see the following table). Only one internal interface card can be fitted to a clock. The local synchronisation output enables the clock to act as a master to up to 5 other similar units, displaying either time or stopwatch counter. The clocks can be cascaded, for instance, each secondary clock can control a tertiary clock. Slave clocks are normally connected in parallel to the master clock using a single 2-core cable link. The specification of the interconnecting cable is generally non-critical and twin 1.5mm sq. is the standard recommendation. The total cable length should not exceed 200m. The 4000 range clocks are supplied in cases suitable for surface mounting on a wall, flush mounting in a panel or with a mounting box for installation in a solid wall. Single and double sided ceiling suspended cases are available. Clocks may be supplied with different case colours and finishes to special order. Special outer cases, providing protection to IP65, can be supplied for use in difficult environmental conditions. 4000E versions are normally powered from an internal 110-230V AC, 50-60Hz AC supply; a non-rechargeable internal Lithium (Li) battery provides a standby supply to maintain the time-keeping in case of a power supply interruption for approximately 1 year and can be easily replaced. The power lead has a UK plug. 24V DC operation is available as an extra cost option. Alternating or static time/temperature display when used with optional 406 temperature sensor. 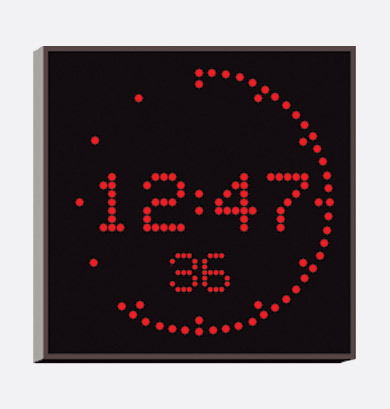 A clock with temperature sensor fitted cannot be used as a master clock or a stopwatch controlled via external wired switches. Catalan, Croatian, Czech, Danish, Dutch, English, Faroese, Finnish, French, Galician, German, Hungarian, Italian, Norwegian, Polish, Portuguese, Russian, Slovene, Spanish, Swedish or Welsh (other languages may be available to special order). The clocks have the ability to display alternative languages sequentially automatically. 4000NE versions of 4000 series clocks combine features of both 4000N (Network) and 4000E (Enhanced) versions. They are available to special order.